The lessor is responsible for the property having a minimum level of security in place. The minimum security relates to door locks, window locks and exterior lights. The security required is specified in the Residential Tenancies Regulations 1989. All rental properties must be in line with the minimum security standards specified in the regulations (as of 1 July 2015). It is illegal for a lessor to remove or change any locks without getting the consent of the tenant first. In most circumstances tenants need to obtain the lessor’s permission to change any locks or fit additional security. Sometimes tenants and lessors agree to share the cost of upgrading security above minimum standards. If this happens it’s important to put it in writing and make sure both parties sign the agreement. Tenants affected by family violence, however, can change locks at their own expense without prior permission. They must provide the lessor a copy of the new key(s) within seven days unless the lessor is the alleged perpetrator. The lessor is prohibited from giving a copy of the key(s) to anyone the tenant has specifically instructed them in writing not to. Tenants affected by family violence can also make prescribed security upgrades without prior permission as long as the tenant tells the landlord beforehand that they intend to make the security upgrades, they’re done by a qualified tradesperson, the tenant (or a funding assistance scheme) pays for the upgrades, and the landlord receives a copy of any invoice. All upgrades should comply with strata by-laws and take into consideration the age and character of the property. At the end of the tenancy, the lessor can ask the tenant to restore the rental property to its original condition. 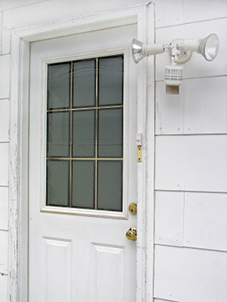 The minimum required security is either a deadlock or an AS 5039-2008 compliant key lockable security screen door. The deadlock can be either a single cylinder or double cylinder. A single cylinder deadlock can be opened from the inside simply by turning the handle or a knob, allowing a person to exit the house quickly in case of an emergency. The deadlock can be separate to the door handle or it can be incorporated into the handset. There is no need to retrofit security if there already is an Australian Standards compliant key lockable security screen with a deadlock fitted. The main entry must have a key lockable door. The minimum required security is either a deadlock, a patio bolt lock (if a deadlock cannot be installed) or an AS 5039-2008 compliant key lockable security screen door. If there is a need to install a patio bolt, it does not need to be key lockable. Screen doors are one option. Windows must be fitted with a lock which prevents the window from being opened from outside the premises. This does not mean having to install keyed window locks, but all openable windows have latches, closers or locks fitted and be in working order. 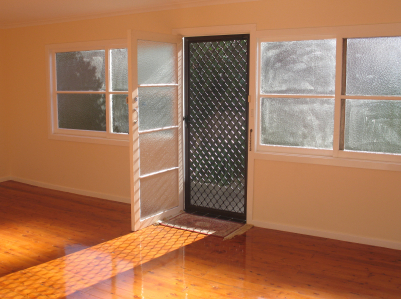 If the window is fitted with an Australian standards (AS 5039-2008) compliant security screen, there is no requirement to retrofit a window lock. Windows must be secured from being opened from outside the premises. It does not have to be key lockable. Minimum required security is an electrical light at, or near, the main entry capable of illuminating the main entry to the premises and is operable from the inside. This doesn’t apply if the property is a flat or apartment and the lighting is the responsibility of the strata body. Security lights need to cover the main entry. Apartments which are not on the ground floor will need to meet the minimum security requirements in relation to the main entry door. If there is a door onto a balcony, security isnot required if the balcony can only be accessed from inside the premises. Window locks do not need to be installed if the windows are not easily accessible from the outside of the premises. Entry light requirements do not need to be installed if the external lighting is the responsibility of the strata company (body corporate) rather than the individual owner. The required locks will need to be applied to all entry doors and windows on the ground floor. If there is a door onto a balcony, you do not need to install the required security if the balcony can only be accessed from inside the premises. The requirements also do not apply to any window situated on the second storey or above in a multi-storey home which is not easily accessible from the outside. Louver windows must have a functioning locking mechanism. If it is not, then another mechanism will need to be installed to allow the lever to be locked in the fully closed position. If the property is on land zoned for agricultural or rural use, it is not a requirement to meet the minimum security standards. 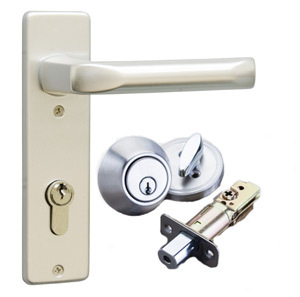 However locks or other devices must be provided and maintained to ensure the rental premises are ‘reasonably secure’. Properties listed on the State Heritage Register are exempt from these requirements however locks or other devices must be provided and maintained to ensure the rental premises are ‘reasonably secure’. There are minimum levels of security for doors and windows for rental properties.